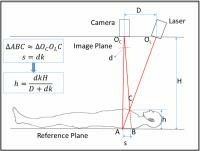 A system for prospective motion correction using field probes and gradient tones is presented that is independent of sequence parameters and thus compatible with clinically relevant scans. An examples of a successfully corrected MPRAGE sequence is shown and the bandwidth and the amount of unintentional head motion is measured during a 32 min. scan. High frequency orientation estimates for fast real-time motion correction using vector observations of gravity and the static magnetic field (B0). In this study we propose a novel approach to motion correction in MRI that separates the challenges of tracking orientation and translation. 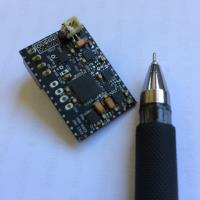 We developed an external hardware device capable of high frequency orientation estimates independent of the pulse sequence. The device takes vector observations of gravity and the MRI scanner’s static magnetic field (B0) and is therefore free from many constraints of some existing external motion tracking techniques. Most notably, no scanner specific calibration is required and the device can be miniaturised. Translation estimates are achieved through the use of 3 high-speed orthogonal navigators. Line by line rigid body motion correction is implemented in a spoiled gradient echo pulse sequence. 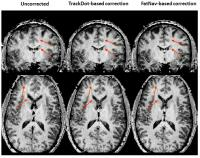 Prospective motion correction with external tracking was applied to high resolution diffusion weighted imaging, using a phase-segmented EPI readout strategy. To detect and correct for residual errors during prospective motion correction, real-time volumetric registration provides continuous feedback to the acquisition. The goal of this study is to evaluate and compare motion tracking with two different modalities: NMR field probes and an optical MPT (Moiré Phase Tracking) camera system. This was done by simultaneously measuring the manually induced motion of a spherical phantom with both systems. Our experimental results indicate that the motion patterns measured with both methods are in good agreement. However, the accuracy of the motion estimates from the field probe measurements are of an order of magnitude worse than the camera's tracking results. A compact solution for phase calculation due to arbitrary rigid body motion based on screw theory is presented. The proposed approach allows for rapid and quantitatively accurate calculations of the phase induced by the switching magnetic field gradients using motion tracking information e.g. from a motion tracking camera. The ability of predicting phase accumulation due to motion in presence of gradients is instrumental for achieving better correction of the motion-induced data inconsistencies for MR pulse sequences with extended signal preparation or readout periods. Carotid artery wall MRI is often affected by complex neck motion. We aimed to separate different motion components and correct them for better carotid artery wall delineation using structured light system. A healthy volunteer was scanned for 2D carotid MRI. It was demonstrated that voluntary abrupt motion, unconscious bulk motion and involuntary respiration can all be detected effectively. Both abrupt motion and bulk neck shift can be corrected for better vessel wall delineation, but the duration of abrupt motion can affect motion correction effectiveness. Bulk neck shift distance optimization by maximizing sharpness can future reduce motion artifact. Recently, several techniques have been developed to be capable of correcting shot-to-shot phase variations of multi-shot acquisition in order to obtain diffusion images with high spatial resolution. However, longer acquisition time of multi-shot EPI makes these methods more sensitive to bulk motion. In this work, we developed a novel k-space based motion corrected reconstruction method for 2D navigated multi-shot DWI. Motion simulations and in-vivo head motion experiments validated the effectiveness of the proposed method, which can remove the ghosting artifacts from minuscule motion and the blurring from bulk motion. Eye-blinks result in significant artifacts in ocular MRI scans, often masking important clinical pathologies, such as small ocular tumors. The aim of this study is to detect and correct for these eye-blinks. We use a fluorine-based field probe to detect these eye-blinks via changes in the local magnetic field. The field probe measurements are linked to the MR-scanner which subsequently automatically reacquires the motion-corrupted part of k-space. This method effectively corrects for the main origin of image artifacts in ocular MRI, and thereby significantly improves the image quality in a clinical setting. 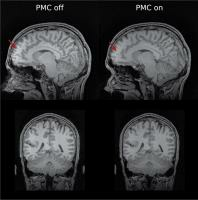 High-resolution imaging can be significantly affected by subject head motion. Here, we demonstrate the use of discrete off-resonance MR markers (“trackDOTS”) in head motion tracking and correction, for high-resolution anatomical imaging. This approach relies on fast 1D-projection acquisitions (under 50ms per measurement) which do not disturb the water signal. These measurements were incorporated in an MP2RAGE sequence, and a 0.6mm isotropic resolution image was acquired from a healthy subject. Motion timecourses estimated from the trackDOTS positions matched concomitant estimations performed with FatNavs (with deviations of 0.09±0.08mm for translations and 0.20°±0.19° for rotations); MP2RAGE image quality was visibly improved upon correction. This work introduces a new visualization method called amplified Magnetic Resonance Imaging (aMRI), which uses Eulerian Video Magnification to amplify subtle spatial variations in cardiac-gated brain MRI scans and magnify brain motion. This approach reveals deformations of brain structures and displacements of arteries due to cardiac pulsatility, especially in the brainstem, cerebellum, and spinal cord. aMRI has the potential for widespread neuro- and non-neuro clinical application, because it can amplify and characterize barely perceptible motion, and allows visualization of biomechanical responses of tissues using the heartbeat as an endogenous mechanical driver.